This will load a page where you can upload your M4A file. First, customize your transcript by choosing the timecode insertion interval, start/end positions and speaker identification. 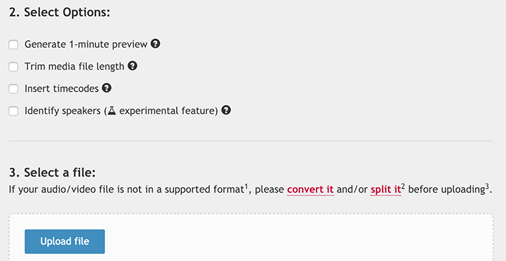 Once you're ready, click on the "Upload File" button to select the M4A file that you want to upload for convertion. Click on "Choose audio/video" to select the M4A file again (due to privacy reasons we don't store your M4A file on our servers). M4A (MPEG 4 Audio) is an audio coding format developed by Apple. An M4A file is a MP4 container containing audio data in either the lossy compressed AAC encoding or via the Lossless (ALAC) encoding. Compared to MP3 files, M4A files encoded with AAC offer better file sizes for the same audio quality.